Knopf Books for Young Readers, 9780399550744, 32pp. 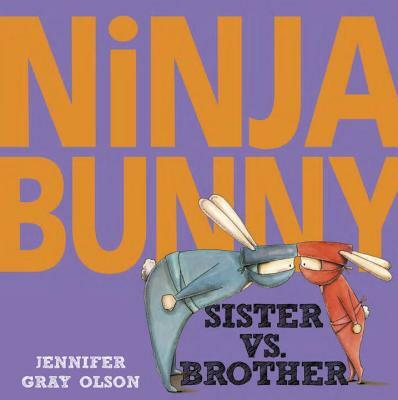 A hilarious new Ninja Bunny adventure featuring a humongous carrot, sibling rivalry, and a pair of ninjas who make a super awesome team. Ninja Bunny has faced incredible danger! He has demonstrated all the skills of a super awesome ninja: impressive strength, amazing bravery, extreme sneakiness! But when he embarks on a new mission to find the Golden Carrot of Awesomeness, he meets his biggest challenge yet—his annoying little sister! She insists on tagging along, and she insists that she is a ninja bunny, too. Not possible. Will she ruin Ninja Bunny’s chance at finding the world’s largest carrot? Or might she actually possess a few ninja skills of her own? Jennifer Gray Olson is a graduate of California State University, Fullerton, where she earned her bachelor of arts degree in art education. Her love of creating funny and offbeat characters, and the worlds in which they live, led her to illustrating. Her first Ninja Bunny book was praised for its “sweetly humorous fun” (Publishers Weekly), “gorgeous illustrations” (New York Journal of Books), and “marvelous simplicity” (Examiner.com). Jennifer lives in Southern California with her husband and three children. To find out more about her, please visit her at JenniferGrayOlson.com, jennifergrayolson.tumblr.com, and on Facebook and Twitter: @jgrayolson.